Aegis is a tasteful departure from Theatre Of Tragedy's last album, the incredible "Velvet Darkness They Fear". The band has sacrificed much of their heaviness in favor of a more melodically defined, and ultimately more memorable, sound. 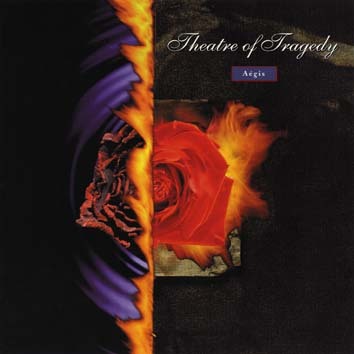 Theatre Of Tragedy uses the male/female vocal dynamic better than almost any band, and that dynamic is explored further on Aegis. The female vocals sound a lot better than on the last album. The melodies are much stronger and more direct, instead of aimlessly floating over the mix like the tended to do on Velvet Darkness. Unfortunantely, the male vocals took a step back. The excellent death vocals have been dropped completely, replaced by often monotonous clean vocals. The music not as complex or intrumentally layered as Velvet Darkness, but is very effective in it's simplicity. The songs are emotional and romantic, creating a rich atmosphere in which the vocal melodies can effectively weave in and out of the listener's conciousness. This is an good album, just not as heavy or dynamic as "Velvet Darkness They Fear".